He's an Olympic gold medalist in the men's decathlon. She's an Olympic bronze medalist in the women's heptathlon. They compete for different countries, but Ashton Eaton's "Canada" cap for wife Brianne Theisen-Eaton proves that their love is hindered by neither borders nor competitions. On Wednesday, Eaton took to the Olympic track to compete for the U.S. in decathlon, in which he currently holds the world record. He won a gold medal for the event during the 2012 Summer Olympics in London, and he's favored to win again this time around. The event will continue on Thursday, but let's just say that Eaton's athletic performance has, so far, been much less controversial than his extracurricular activities in Rio. That's because Eaton is married to Canadian heptathlete Theisen-Eaton, who took home a bronze medal a few days earlier in her own event. They might be from competing countries, but that doesn't seem to change anything between them. Eaton and his wife are basically the most athletic couple in the world. They're track and field royalty. And to top it all off, the pair also perfectly embodies #RelationshipGoals, especially after Eaton sparked petty controversy for sporting a red "Canada" cap in support of his wife in Rio. He was criticized on social media for the move, with some calling him a traitor to America. Still, he stood by his outfit, and more importantly, by his wife. 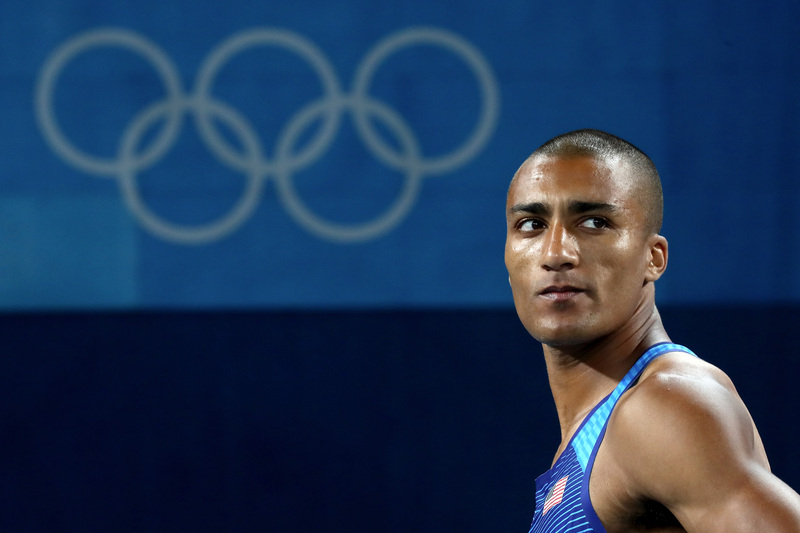 Perhaps most notably, Eaton didn't let the drama overshadow his wife's Olympic achievement. This week, the roles reversed and it was Eaton who took the field to compete. As Theisen-Eaton looked on in support, she also dressed the part. Although she didn't wear a Team USA hat, she donned a shirt that showed her support of both the American and Canadian competitors. Aside from their official team loyalties, the Eatons share much of a career. According to BuzzFeed, they train together near their home in Eugene, Oregon. Although she now lives in the U.S., Theisen-Eaton was born and raised in Humboldt, Saskatchewan. For his part, Eaton hails from Oregon originally. They competed together at the University of Oregon, and they share a coach to this day. They also share a brand, aptly named Eaton. The Eatons are just one of several married or engaged couples to be competing in the Rio Games, but they may be the only couple to compete for two different countries. It's quite a unique situation — and, clearly, not all Americans are comfortable with it. The Eatons themselves, on the other hand, seem to be handling it just fine.